John and I have joined the weight loss challenge at ClubSport. I am thinking that some sort of new thing with emphasis on exercise may help. I don’t know if either of us is ready for the challenge of being strictly on plan for the next 18 months. I think that we need to at least give it a try. I have met my personal trainer who is a very nice man named Vernon. He has a lot of experience with post-surgery people. Although I am two years out of surgery on my knee, I am still having a lot of difficulty with simple things like going up and down stairs. Vernon and I are going to work on strengthening the muscles around my knee to make everything more functional. 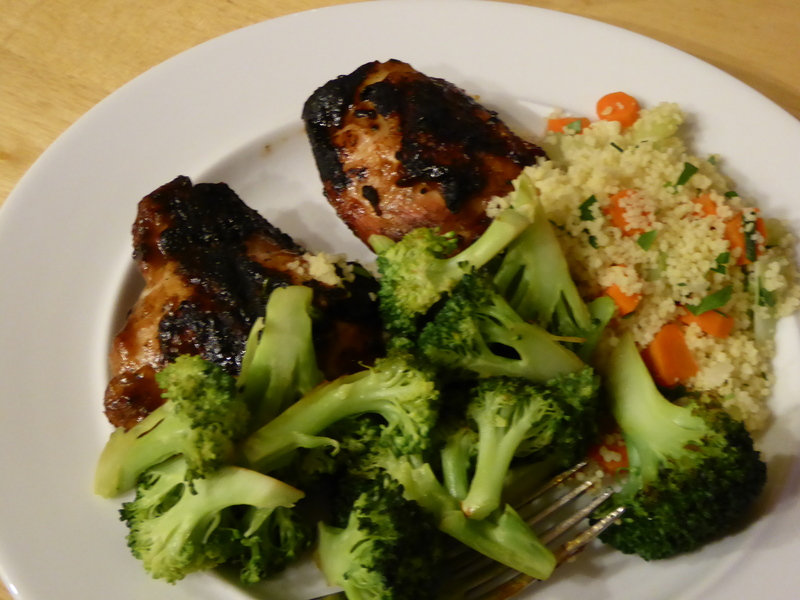 Our first dinner after joining the challenge is grilled chicken thighs with BBQ sauce, couscous and vegetables, and broccoli. I know I need to take the skin off the chicken but otherwise the dinner is pretty plan-centric.